Nothing beats a terrific burger. It is the easiest & most delicious food to cook while you are camping because it is packed full of carbs and meat. 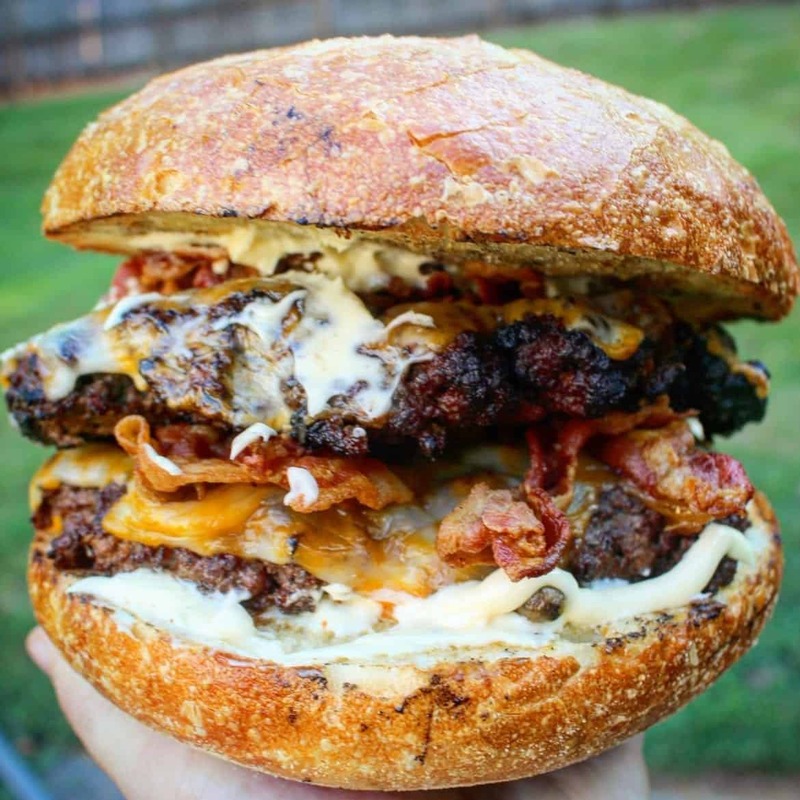 Add some cheese & bacon to the top and you are in burger heaven. The biggest problem with burgers is that you have to cook a bunch of them all at the same time. This can be a pain at the RV site because some grills are not large enough to fit everything. Plus, who wants to waste time cooking burgers when you are super hungry from a day adventuring. Here is the solution: Mega Bacon Cheeseburger! Easily make this on any grill! What’s so awesome about the Mega Bacon Cheeseburger? I had a vision while cooking burgers with my friends about turning 4 burgers into one mega burger. What we created was a massive monstrosity of meat and cheese. Stacked burgers into on large single patty until it became ridiculous. It was a night to remember! 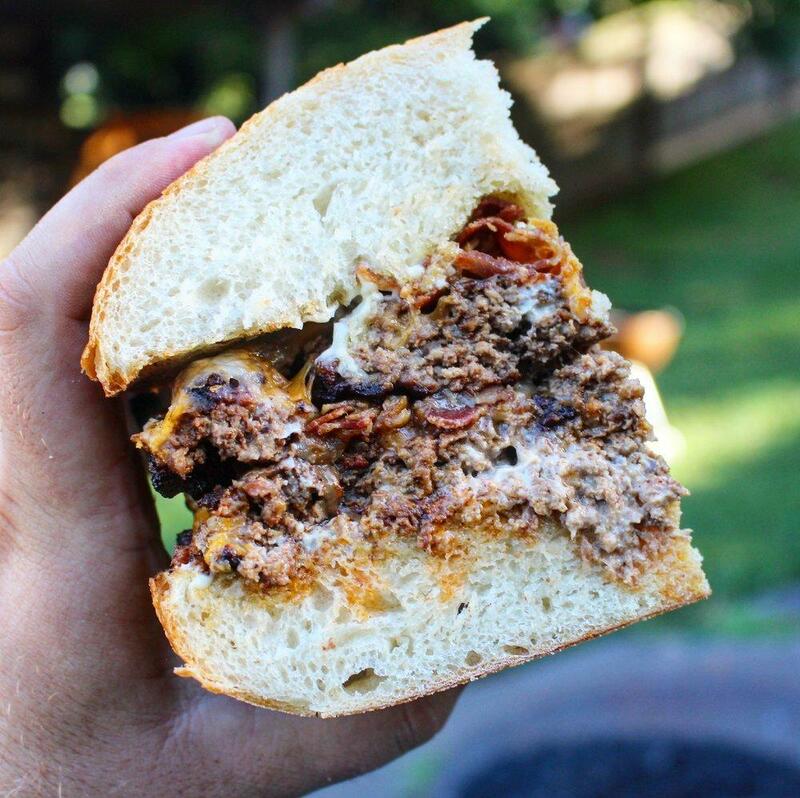 The Mega Bacon Cheeseburger is a double decker beef paradise with tons of cheese, mayo, bacon and meat. 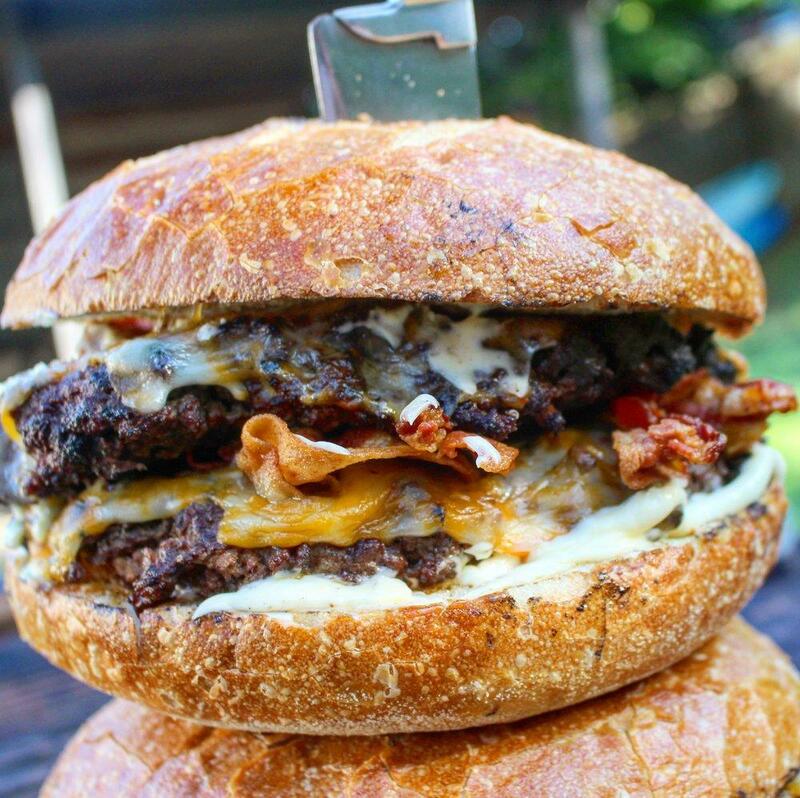 It can be created at any campfire or campsite that can handle its mega patties. Best part is that all these ingredients are super easy to get while traveling the road in your RV. Stack the burger as high as you want! My favorite part about this dish is how easy it is to cook. All the ingredients you can find on the road at any local grocery! Plus, they do not take up a lot of space in your RV while still giving you delicious food. So try my Mega Bacon Cheeseburger now because it is delicious and awesome! And stay tuned for more recipes to come while I cook over fire in an RV! Keep those fires rolling friends! 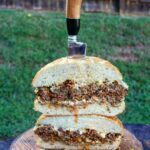 Try a massive cheeseburger made with a loaf of bread as a bun! Savory and fun for the whole family. In a mixing bowl, add all the ground beef, eggs, chipotle powder, chili powder, smoked paprika, sea salt, cinnamon, cumin & ground black pepper. Mix the beef thoroughly. Next, use half of the beef to make 1/2 inch thick burger patty. Make sure to round out the edges and have no cracks in the patty. Do this to the other half of the ground beef till you have equal size patties. 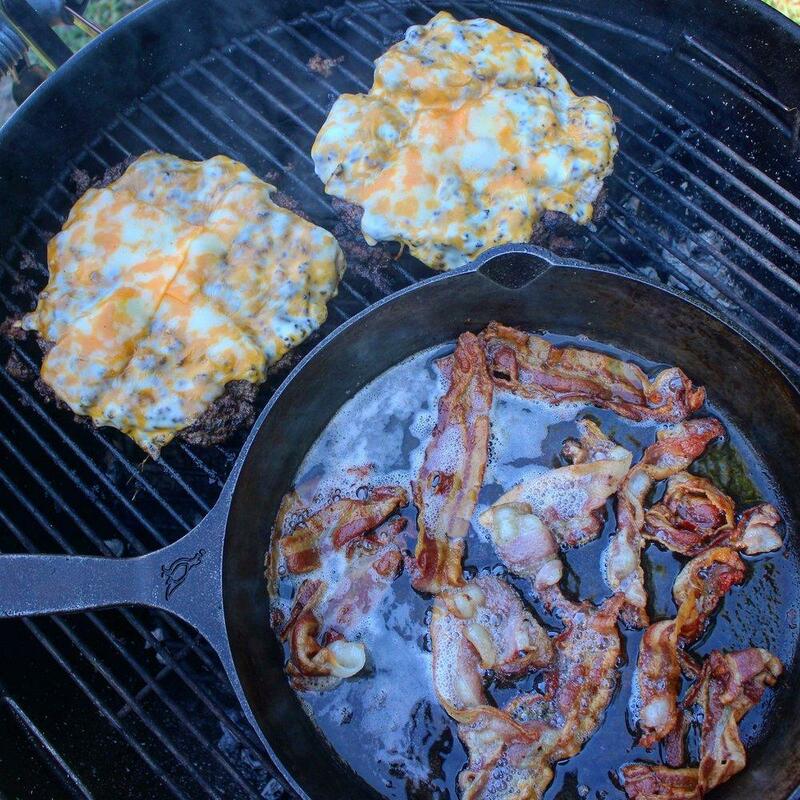 Once fire has reached a nice medium temperature, add a cast iron pan to the grill and place you bacon on it. Cook the bacon to its desired temperature, then pull off and let rest. Using a spatula, place both burger patties over the hot part of the grill. Let cook for 4-5 minutes per side. Make sure to add cheese to patties 2-3 minutes before being done in order for it to melt. ***PS: Beware of flare ups from the burger grease! Also, use two spatulas to flip the burger. This will help them from breaking apart. Once burgers are done, pull them off and let rest. Slice the bread in two, add butter and place on grill for 1 minute to crust up. Once everything is complete, lather bread with mayo on both pieces then add burgers topped with bacon. Use a wooden skewer through burger to keep in place if necessary. Equipment Needed: Fire pit/grill, cast iron skillet, spatula, wood, and fire starters.